Heat oven to 350°F. 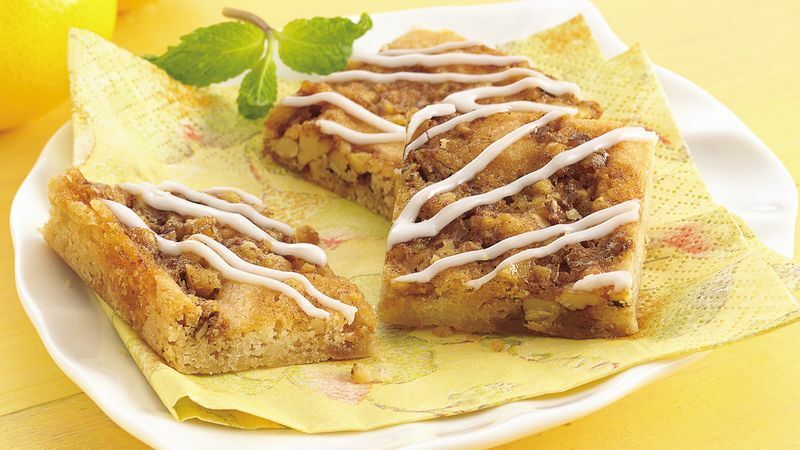 Cut cookie dough into 1/2-inch slices; arrange in bottom of ungreased 15x10x1- or 17x11x1-inch pan. With floured fingers, press dough evenly in pan. In medium bowl, mix remaining bar ingredients. Drop mixture by 1/2 teaspoonfuls evenly over cookie dough; spread slightly (dough will not be completely covered). Bake 15 to 20 minutes or until light golden brown. Cool completely, about 20 minutes. In medium bowl, mix glaze ingredients until smooth; drizzle over bars. Cut into bars.